I went out to Dillingham on Monday with Harvey and Allan, to conduct some thermal research on the sea breeze. I've probably only flown there about a dozen times, but I always wish I could get out there more often. 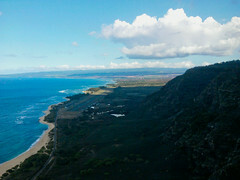 It's our westernmost flying spot on the island: the wild west of our paragliding world, the badlands of Oahu flying. We had sagebrush, sailplanes, skydivers, speedflyers, a six shooter of Sierra Nevada, and a sick sunset to go with those sweat-soothing suds. We met at the trailhead for the climbing wall, just past the airfield and Camp Erdman. What a great launch Scot has found for us out there, along the climbing wall trail. I don't think many of us have been up there yet, but it's definitely worth a trip out there to check it out. I learned some interesting new facts and figures about the Dill today. First, it's 45 minutes from my house - closer than Makapuu! Second, it's an incredibly short 35 minutes from Makapuu, if you happen to be coming from there! Allan timed it, and he swears he drove the speed limit. Third, it's a 13 minute hike to Scot's new awesome launch, halfway up the climbing wall trail - that's shorter than the hike up Kahana. (Of course, you have to hike at Berndt speed, as Allan described it - might be closer to 20 minutes for a normal person.) Fourth, and most surprising, even though I thought we needed a wind direction close to due north, it turns out that Scot's launch works just fine at 40 degrees on the Mokuleia sensor! Who knows how much east it can handle - we'll just have to continue our research out there. Thanks to Harvey for being the wind dummy, I mean, the launch technician. And it was a great experience for me to stay behind and help Allan try to get out of there safely. The airflow wasn't really cooperating, and he didn't end up getting out, but he stayed safe, which is the most important thing. Harvey landed after about an hour of soaring along the ridge between the gliderport and Kaena Point, but by the time Allan stepped aside and insisted I take my turn, the sea breeze had decided to retire for the day. So I showed Allan a death-defying dynamic reverse launch down the chute in zero wind, which he said looked like downhill skiing. That place is similar to Tomato Patch, everybody's favorite Makapuu launch: even when there's wind, the air just doesn't flow on launch. But it's a much better hike and launch than any of the others we've found out there. Thanks to Allan for the motivation to head out there. I was definitely in the mood for something a little different today, and a spicy, crunchy, dill-flavored snack turned out to be just the thing. And thanks to Harvey for undertaking a mission to procure some tasty beverages. He surely owed us some cold ones after such a great first flight out there! I'm sure I don't need to point out that those beverages are responsible for the name of this story. Also, Harvey told us he's just about to take a job at the Crouching Lion as a bartender. What a perfect gig for a pilot! Now we just need to convince them to start stocking some decent IPAs on draft. Finally a morning of good coffee read. I love the story and you had me packing till you mentioned "Tomato Patch". Yikes. Alan needs to go into therapy soon or he may find himself living in his truck at launch. Hope to get up there soon too, looks like I will have to shown the way by the "Gangster"
hopefully I'll get to fly it again... it is crazy cool out there!